This model has been built using the expressions found in the supplemental data of Garmendia-Torres's 2007 paper on oscillations of Msn2 due to PKA activation. This model reproduces the curves on Figure 3, page 1047, using the corresponding initial values and the parameters found in Table S2. The variable Str has been given a value of 1 in order to show oscillatory behavior but may be changed to 0 or 2.5 for low and high values. This file is known to run on COR 0.9 and OpenCell. At intermediate intensities, stress induces oscillations in the nucleocytoplasmic shuttling of the transcription factor Msn2 in budding yeast. Activation by stress results in a reversible translocation of Msn2 from the cytoplasm to the nucleus. 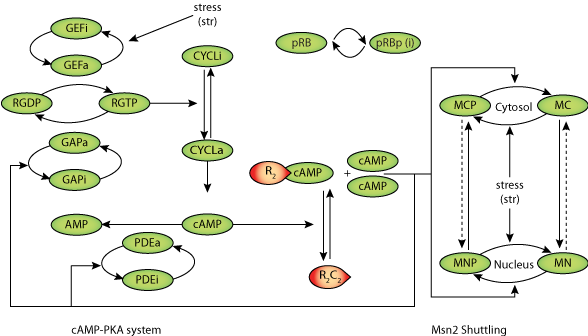 This translocation is negatively controlled by the cAMP-PKA pathway through Msn2 phosphorylation. Here we show that the nuclear localization signal (NLS) of Msn2 is necessary and sufficient to promote the nucleocytoplasmic oscillations of the transcription factor. Because the NLS is controlled by protein kinase A (PKA) phosphorylation, we use a computational model to investigate the possibility that the cAMP-PKA pathway could function as an oscillator driving the periodic shuttling of Msn2. The model indicates that sustained oscillations of cAMP can indeed occur in a range bounded by two critical values of stress intensity, owing to the negative feedback exerted by PKA on cAMP accumulation. We verify the predictions of the model in mutants by showing that suppressing this negative-feedback loop prevents the oscillatory shuttling but still promotes the stress-induced nuclear localization of Msn2. The physiological significance of Msn2 oscillations is discussed in the light of the frequency encoding of cellular rhythms. (A) Time evolution of RGTP, cAMP, active PKA, and nuclear Msn2 predicted by the model for three different values of Str, the dimensionless parameter measuring stress intensity. At low value, Str = 0 (dotted blue curves), and at high value, Str = 2.5 (dotted red curves), a steady-state level is observed for the different components, whereas at intermediate value, Str = 1 (green curves), sustained oscillations occur. The curves show the oscillatory behavior after the elimination of transients. (B) Envelope of cAMP oscillations as a function of stress intensity showing the maximum (red curve) and the minimum (blue curve) values during sustained oscillations. The variation of periodicity (green dots) is also shown. (C) Envelope of oscillations in Msn2 subcellular localization. The curves show the maximumvalues (Max) and minimum values (Min) for cytoplasmic Msn2 (in blue) and nuclear Msn2 (in red). Outside of the oscillatory range, the system reaches a stable steady state. The curves have been obtained with the Berkeley Madonna program, by numerical integration of Equations S1-S4. Parameter values are given in Table S2. Initial conditions were as follows: GEFa 0.36, GAPa 0.5, RGTP 0.1, CYCLa 0.1, cAMP 1, R2C2 0.5,MC 0.25, MN 0.25, MCP 0.25, MNP 0.25, and PDEa 0.5. Derived from workspace Garmendia-Torres, Goldbeter and Jacquet 2007 at changeset 99e423da60ca.